1 Clinton had the dotcom bubble, and cheap oil too! that sure helped to keep BAU Full Throttle, baby! mmm didn’t Clinton ‘set-up’ the GFC by eliminating Glass-Steagell. They all cooked the books in their own way. All are war criminals as far as UN definition goes. But that is what sustaining an empire requires. All went to church to virtue-signal to the punters, but they all have so much bl**d on their hands. Simple comparisons during presidency are useless indicators. Whats the legacy? Adding China to the World Trade Organization in 2001 greatly increased the demand for oil and all commodities. This, together with China’s added debt to finance all of this growth, helped bid up oil prices to unaffordable levels for oil importers. While banks could cool their books, the underlying issue was the unaffordability of goods and services made with $147 barrel oil. Lots of things went together. Sounds fair. Yeah, what’s the legacy? Who would come tops on drones used in extra-judicial murd – hers, and in number of new countries invaded? In america, the world’s largest economy and its second biggest polluter, climate change is becoming hard to ignore. Extreme weather has grown more frequent. In November wildfires scorched California; last week Chicago was colder than parts of Mars. Scientists are sounding the alarm more urgently and people have noticed—73% of Americans polled by Yale University late last year said that cc is real. The left of the Democratic Party wants to put a “Green New Deal” at the heart of the election in 2020. As expectations shift, the private sector is showing signs of adapting. Last year around 20 coal mines shut. Fund managers are prodding firms to become greener. Warren Buffett, no sucker for fads, is staking $30bn on clean energy and Elon Musk plans to fill America’s highways with electric cars. Looks like we may have a few more years of BAU….Wonderful ..I can look forward to many more posts here with all my friends…. There is nothing we can do about the climate, as far as I can see. Maybe some geo-engineering plan can do something, but I wouldn’t count on it. So we end up with endless stories of this sort. I agree Gail. It would take global cooperation to make an attempt at climate action but we can hardly drive down the street without fighting each other. I’m with David, Uncle Bill and others here – hopefully we can keep BAU running for as long as possible. It is more than global cooperation that would be needed. 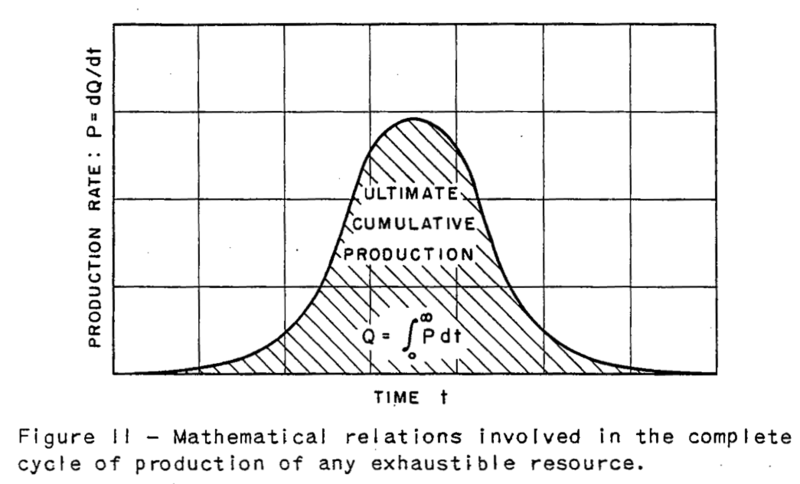 The story about “renewables can save us” or even help the problem is simply false. The models “proving” this are constructed in a way that proves nothing. In order to use less, we need a new guiding story, explaining how the economy can use less and how this will change peoples lives. One example would include taking women out of the workforce. Then, what jobs were available could go to men. Women would have more time to care for family at home, including elders. There would be less need for homes for the elderly. Also, young people would need to again live with their parents until they marry. Women’s schooling would need to be dramatically cut back. Spending on health care would need to be dramatically cut back as well. Spending on things like home decoration and remodeling would need to fall way back. Spending on special accommodations for the handicapped would be cut way back. We would need to go back to spending energy only on “essentials” in some sense. Needless to say, it is hard to see how people would accept these kinds of changes. We now have a picture of a different world in front of us. Going back to the old “unenlightened” ways would seem crazy. The other issue is that the financial system could not withstand these kinds of changes. Many assisted living organizations would fall into bankruptcy. Many fewer homes would need to be occupied, as families moved in together more. The need for processed food would go away because women at home could prepare from scratch again. 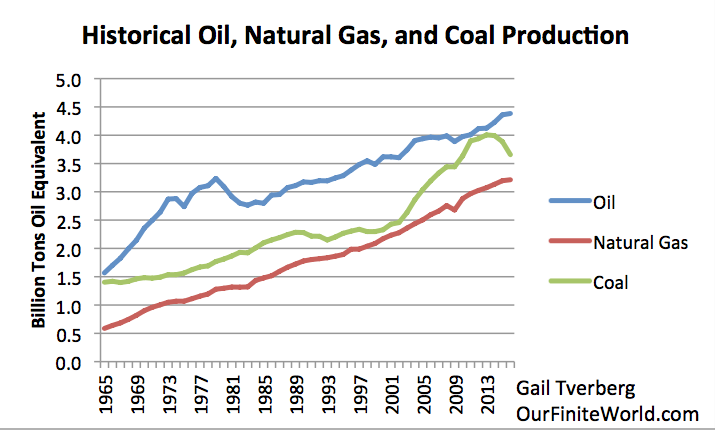 The price of oil, coal, and natural gas would fall even farther than today. The companies extracting these fuels would go bankrupt. The governments of oil exporting countries would be overthrown, because they could not collect enough taxes to operate their countries. The whole system would fall apart, even if we did try to go back to what seemed to work before. Gail, love your response. The first time I have seen someone tell that truth. Keep up the good work it helps us feel not crazy. I don’t understand why people “accepting ” facts matter. 1) Social and economic programs would need to be rolled back. 2) Society is too invested in these programs to accept them going away. So maybe we need some different approach. You can roll back material consumption (without sacrificing major social–not economic–expectations), but only artists have the skills to do that on a global scale. The trouble is that artists don’t read OFW, and so are wasting those skills trying to succeed in a failing system. I AGREE…more importantly Exxon-Mobole AGREES….can they do the impossible? Satisfy need of Fossil Fuels for 8 Billion people with increasing demand? Rust never sleeps….should be a good show. Not a lot of people know this, but now readers of this site can be among the cognoscenti. Or you can elect to remain mired and wallowing in ignorance. It’s entirely your own choice. National Socialism (Fascism) vs. International Socialism (Communism). Time to choose sides. Let’s turn it into another blood fest. The politically correct high command in France is still only using teargas, stun grenades and rubber bullets against their own people. Somewhere a banker rubs his hands together in glee. Gosh, thugs of both sides are indistinguishable! Who would have guessed? The Baltic Dry Index is plunging. The price is now below the break even point and would have to double to make it economic for ship owners. The reason for the plunge is said to be a slowdown in China. “China’s Lunar New Year holidays through Sunday saw single-digit consumption growth for the first time on record, as an economic slump dampened one of the year’s biggest shopping seasons.” [8.5% growth doesn’t sound too bad to me but it still constitutes a major disappointment in context]. Yoshua, thanks! That looks worrisome. The Slovak police officers openly talk about being forced to collect more money from penalties and being threatened and mobbed by their chiefs. Some of them leave the police or end up in psychiatry ward. Poor little Alex…that’s too bad…. When the police could still give the right people a good belting, Britain was a lot less violent. Same goes for Spain: the one good thing about the dictatorship. One thing is good belting for the perpetrator, another thing is getting money for finanincing the police. I am affraid the current situation is more about getting money from somewhere. Back years ago, before Interstate Highways became into as widespread use, collecting revenue from speed traps seemed to be a popular way for small towns to collect more revenue. It helped if a major road went through the town. An Italian friend told me a good story about the speed limits being changed over-night, with no warning, with the police being out next day to collect all the fines…. “The idea was once things had stabilised, the central banks would just allow the bonds to be run off to maturity. Pfft, gone. “It was supposed to be a relatively short-term addiction, but as it is said, “old habits die hard”. Dangerous habits often have an even stickier end. “A concerted money printing operation by global central banks already appears to have kicked in weeks before Mr Powell opened up about the possibility of getting back on his “full range of tools”. “As Donald Trump rhapsodised last week about the “unprecedented economic boom” he is seeing across America, central bankers in Australia, India and the UK were preparing to join a broader retreat from plans to tighten monetary policy. Better get my skates on though! “The British economy plunged into reverse in December, with a broad-based slump in economic output completing the weakest year for growth since 2012. If that were true then why did the US have to borrow 1T to cover the deficit, he said would never happen because the massive tax cuts he and the R’s did were suppose to jack the economy up high enough that in spite of huge tax cuts the deficit would actually decline? He exists in an alternate reality. Context that, when presented to a neutral observer, would severely undermine the cartoonish narrative being advanced by US media. (1) Not only has the international aid community not asked for the “aid,” earlier this week, both the International Red Cross and United Nations warned the US to explicitly not engage in these types of PR stunts. Bloomberg) — Two large Chinese borrowers missed payment deadlines this month, underscoring the risks piling up in a credit market that’s witnessing the most company failures on record. China Minsheng Investment Group Corp., a private investment group with interests in renewable energy and real estate, hasn’t returned money to bondholders that it had pledged to repay on Feb. 1, according to people familiar with the matter. And Wintime Energy Co., which defaulted last year, didn’t honor part of a restructured debt repayment plan last week, separate people said. There was a Financial Times article referenced here recently called China’s Private Sector Struggles for Funding as Growth Slows. Non-state companies, including foreign-invested enterprises, account for more than half of total economic output in China, and anywhere between 50 and 90 per cent of tax revenues, spending on research and development, urban employment and exports. Until recently, privately owned companies in China could survive by tapping funds from the country’s enormous shadow banking sector. 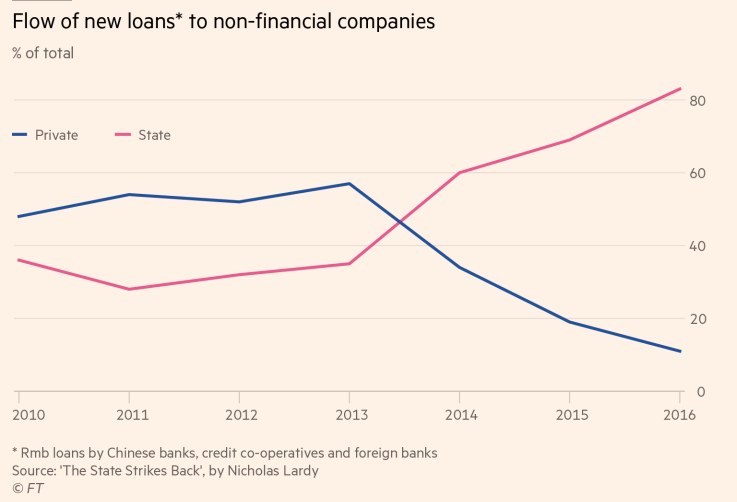 But shadow financing began to dry up as Chinese officials, led by Vice-Premier Liu He, ramped up a campaign to stabilise debt at non-financial companies, which is estimated at about 300 per cent of GDP. I wonder how much of these issues are involved. I don’t think we would be hearing about defaults on debt owed by state owned companies. The government would simply hide the problem in some way. But the private sector is very important. Without access to enough debt from some source that charges reasonable rates, new investment in the private sector will shrink greatly. Russian govenment planning to spend 26 trillion rubles ($400b) on national projects in the next 6 years. Most of it are infrastructure spending (roads, ports, etc…). Last decade most of the income from oil revenue was spent on import. Now the politics has changed to spending inside the country. It will require lot of energy, raw materials and less import from western contries (like cars, machines, equipment, etc…). With all of its exports, Russia doesn’t need to be a debtor to afford all of its imports. I am not sure what Russia’s debt level has to do with anything. Russia is a big oil exporter, as well as an exporter of coal, iron ore, scrap iron, wood pulp, fertilizer, and a few manufactured items. It imports a long list of items including broadcasting equipment, computers, harvesting machinery, cars, vehicle parts, packaged medicaments, medical instruments, shoes, and a number of kinds of foods (such as citrus, grapes, soybeans). Trading economics indicates that its imports are down since 2014 when oil and quite a few other commodity prices dropped. 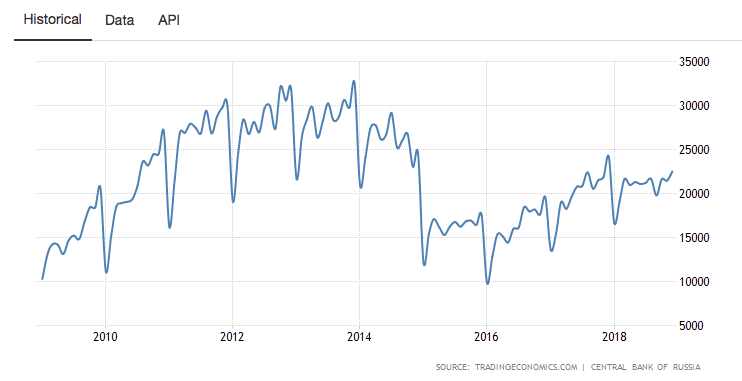 Lower imports for Russia (now that prices are down from the level earlier this year) helps reduce world demand for goods and services, and thus tends to depress commodity prices. Lower imports are primarily recent embargo based. They mostly solved it on the core food imports already, reviving domestic food sector instead (investment), on replacing the industrial analogues it will take more time, but it’s ongoing process. 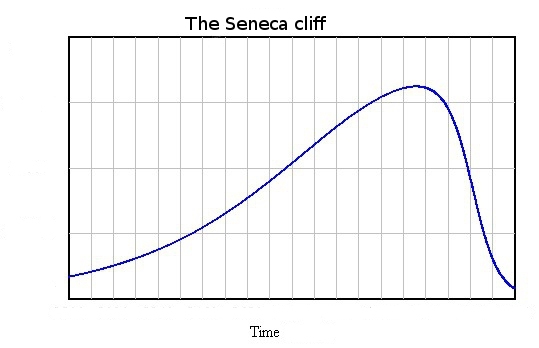 In terms of oil prices, they joined the OPEC pricing snake liftathlon, which might unravel again if that sort of wide ranging depression and energy price massacre you predict finally arrives.